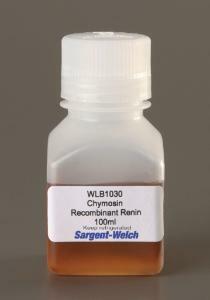 A 100% natural chymosin from natural fermentation, chymosin is a coagulant often used for cheesemaking. Activity: Minimum 600 International Milk Clotting Units/ml (IMCU/ml). pH: 5.60 to 5.95. Refrigeration is required. Minimum Shelf Life (months) is 12 months. Used in lab 1C of Biotechnology: Science of the New Millennium curriculum. Note: Perishable. Delivery date required. Please Note: This product is designed for educational and teaching laboratories and no certificate of analysis is available.